At this time of year I create custom arrangements and wreaths at the garden center. Over the years I’ve seen that the most popular compositions are those that use natural materials. Anything created with cones, shells, and greens is the first to sell, and with good reason. The natural world has been the genesis for celebrations since the beginning of such festivities. Our very life is dependent on the seasons, plants and animals that surround us. Anyone who pays close attention to nature is continually called to marvel at the miracles that surround us. As we in the North Country go into our cold season, we’re especially appreciative of the reminders of growth that remain. 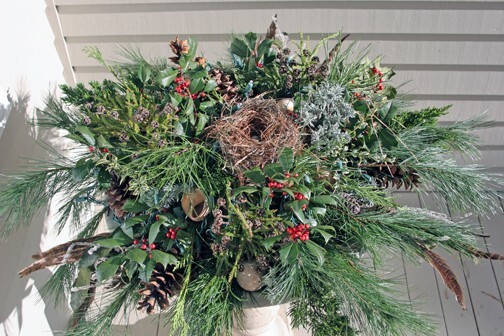 Frost tolerant and evergreen plants, berries, and seedpods are used for our holiday décor. We celebrate signs of endurance and the markers that remind us that this period of dormancy isn’t permanent. For my birdbath arrangement I cut white pine, Hollywood juniper, variegated boxwood, American holly, and lavender. In addition to cones, seashells and feathers I used the bluebird nest we found when cleaning out the bird houses this fall.